No fewer than three people have been killed, while seven others were injured following collapse of a two-story Islamiyya school building under construction at Unguwan Kaya, in Zaria, Kaduna State. The News Agency of Nigeria (NAN) reports that the ugly incident occurred on Friday while construction work was ongoing at the building. Speaking with NAN at the scene of the event, Malam Abdul-Muminu Adamu, the Divisional Secretary, Nigerian Red Cross, Zaria branch said the incident was unexpected and very frightening. “Shortly when the incident happened, a good Samaritan called and informed us and we reported to the scene immediately. “When we came here, we were able to recover the bodies of two people and later recovered another body while seven other people were rescued alive. “The corpses of the deceased have been deposited at the Ahmadu Bello University Teaching Hospital (ABUTH), Shika. “While the injured persons are also responding to treatment at the same hospital,” he said. Mr Paul Fedelix-Aboi, the Director of the state Fire Service described the development as unfortunate, saying that the actual cause can only be ascertained after investigation. He said, though the rescue operation is not part of their mandate, they were in the area to render possible assistance to rescued persons. Felix-Aboi attributed the recurrence of building collapse in Nigeria to attitude of Nigerians who always go for cheap labour. The director advised people to always employ the services of building professionals to put an end to building collapse in the country. On his part, the Executive Secretary, Kaduna State Emergency Management Agency (SEMA), Mr Ben Kure described the incident as sad and frightening. 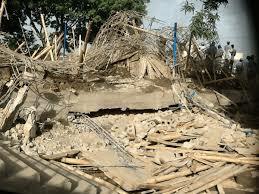 Kure said on receiving the report of the incident, men of the agency were mobilised to the site to render assistance. He said work was still on at the scene of the incident to remove all the concrete in case other victims were still lying under the collapsed building. Kure assured that the agency would on Saturday present assistance to the families of the deceased and the injured persons.